The sharp increase in asthma since the 1980s -- some 34 million Americans now suffer from the condition -- has confounded health professionals. To get some answers, we turned to Dr. Stephen Apaliski, an Arlington, Texas-based asthma and allergy expert who is the author of the new book, "Beating Asthma: Seven Simple Principles." In recognition of National Asthma Month, the book is available as a free download at smashwords.com. Q. Why is there such an asthma epidemic? A. A lot of researchers are scratching their heads over this. The increase is not only in America, but worldwide. Some of the theories range from improved hygiene and the fact that we've become too sterile -- so kids are not exposed to as many germs today -- to air pollution, and even the widespread use of acetaminophen in children. But no one really knows for sure. Q. Why are we so poor at controlling this? A. We know that when physicians give medical advice, patients taking or understanding the advice is remarkably low. For example, studies show poor adherence to taking medications properly. ... I'm always amazed that people just stop taking their meds. We used to think this was about poverty, but this inability to understand basic health information is really happening across the board and is quite perplexing. We have the best medication and the best understanding of this disease and yet we're still facing 4,000 deaths a year. Q. To combat attacks, you talk about the importance of having an asthma action plan in place. Can you explain? A. It's about avoiding triggers, taking medications, seeking medical attention early when you start developing problems. Probably two-thirds of all asthma cases are not well controlled and if you just do those things, you'll go a long way in relieving suffering. Q. Let's talk about triggers. I've read that many of the chemicals in cleaning and personal care products are linked with asthma flare-ups. Is this true? A. It's really the untalked about issue. Perfumes and colognes are more accepted than smoking, but can also serve as triggers for asthma attacks. And when you're cleaning, pay attention to VOCs -- or volatile organic compounds -- which can also trigger symptoms. Some of the green products now available are low in these irritants. Q. Do you think we'll see fragrance-free zones the way we have smoke-free zones? A. Absolutely. I think one state in New England has tried to legislate that ... which is the first tiny step. Q. Why do so many poor kids suffer from asthma? Is asthma a disease associated with socio-economic level? A. Poverty is certainly a factor. Some of the patients I see are having a very tough time in this economy and medications are very expensive. Q. 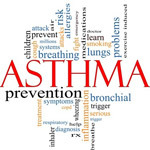 You say many asthma-related deaths are preventable. What's the single most important step someone with this chronic condition can take to care for themselves -- especially if they don't have health insurance? A. Establish a relationship with a doctor that is knowledgeable about asthma. They get samples from pharmaceutical companies ... which provide a fair amount of medication to people who can't afford it. As asthma experts we have the best outcomes -- but even having a relationship with a nurse practitioner will help.